If beauty is in the details, then there is no greater beauty than the rings in Vanna K's Hand-Engraved Collection. This featured ring showcases the truly unique designs Vanna K has to offer. 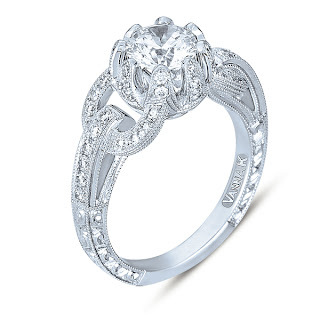 With the use of micro-paved diamond settings, Vanna is able to create a beautifully-detailed work of art. The diamond-encrusted band opens up to to form a chain link with two forward-facing circles of diamonds. The details continue as the 1 Carat center stone is set in the grasp of prongs lined with micro-paved diamonds. With a Total Carat Weight of 1.5 diamonds, this Platinum ring sparkles at every angle. But the real beauty is in the details of the design. This is what sets a Vanna K hand-crafted ring apart from all others. This is something she can be proud to wear and feel special knowing it's a one-of-a-kind beauty just like her. Find this ring and other beautifully unique diamond engagement rings today at Vanna K.